Scheduling your client appointments should be simple and seamless. Get help from an Acuity Certified Expert. It’s the beginning of every dreaded booking conversation if you’re not using a proper system. That back and forth can be enough to drive you crazy, and if your client needs to reschedule, you get the pleasure of doing it all over again. Match timezones, comparing availability, and setting up the meeting arrangements–enough already! The harder it is to book a call with you, the less effective your meeting will be (especially if it’s an on-boarding consultation). If you want to book that client, your booking process needs to be painless. Not to mention, I’m sure you have better things to do with your time than answer the back and forth emails, right? I thought so. It’s more than just a scheduling tool. Acuity Scheduling gives you the professional edge that puts your clients instantly at ease. Set customized availability and integrate with your digital calendar to ensure you’re never double-booked. Clients schedule in their own timezone, clearing up scheduling headaches in a snap. Customize everything to match the look and feel of your existing brand, and even embed your calendar straight on your website for a seamless booking experience. Or don’t. It’s up to you. Acuity allows you to sell gift certificates, set up packages, memberships, and even give group classes. Collect your payments upfront along with any other information you need so that you are prepared for your session. I’m an Acuity Certified Expert (ACE) who can get you up and running in a flash. 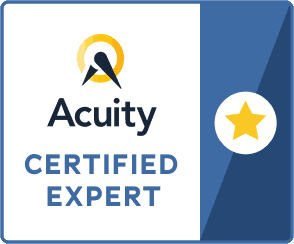 My advanced knowledge of Acuity features and capabilities is at your fingertips to help you get the most out of your Acuity Scheduling account. Acuity is powerful enough to be a complete system for some entrepreneurs. But you’re probably not just “some entrepreneur”. I can help you integrate Acuity Scheduling with the other tools you’re using to keep your processes organized and your customer experience seamless. Let’s be honest, you probably have way better things to do than tinker with a bunch of settings on a new tool (or one you just haven’t had time to figure out yet). You’d rather be serving your client than figuring out the logistics of getting them on your calendar anyway. This session is for you if you’ve already started trying to use Acuity but need some hands-on help. You’re probably more of a DIY-er, but you understand the value of having an expert show you around. You get me all to yourself and we can do a traditional Acuity tutorial, or you can bring targeted questions or problems and get them answered. Either way, my 5+ years of experience with this platform is at your disposal. This session is done via screen-share and recorded for your convenience. Whether you’re new to online scheduling tools or ready to move to Acuity from another platform, I’m here to help you! This package is perfect for anyone who values their time and wants to learn to use the system functionally, but not deal with all of the fiddling around of setting it up. From simple setups to multi-employee and complicated integrations, I have the experience to get you up and running in a fraction of the time it would take you to do it on your own. This is for you if you’re integrating Acuity as part of a larger business eco-system. Over the span of three months, we will set up Acuity and integrate it with the other parts of your business eco-system. This typically includes CRMs, email marketing platforms, or project management tools. This package includes a Blueprint session to design your eco-system, followed by five follow-up calls over the span of three months to keep the implementation on track and provide tutorials as needed.